After World War 2 ended in 1945, the major British oil companies were faced with the task of re-establishing their oilfield operations, particularly in the Middle and Far East. A large number of drilling rigs had been destroyed and most of those remaining were in need of replacement. The engines (predominantly German, such as MAN) originally supplied for driving the rigs had been used for other purposes during the war and were worn out. The main manufacturers of oil rigs and suitable engines for driving them were the Americans. Also in favour of USA suppliers was the fact that they had considerable experience of supplying equipment to the oil industry and were therefore familiar with its special needs. However, post-war Britain was struggling with a difficult economic situation, one facet of which was an acute shortage of foreign exchange. This forced the government to impose a tight clamp on spending outside the sterling currency area. British oil companies were therefore under great pressure to purchase their equipment within the sterling area which ruled out buying from the USA. The only British manufacturer of oilfield equipment at that time was the Oil Well Engineering Company (OWECo) at Cheadle Heath, Stockport. A consortium of Shell, BP, Iraq Petroleum Company, the UK Government and the National Supply Company of America entered into arrangements for OWECo to manufacture National Supply's Ideal 50 and 100 rigs under licence, together with their associated series 250 and 350 'slush' pumps. That left the matter of finding engines to power the rigs and pumps. The government had many spare Paxman 12TP engines available from the wartime tank landing craft programme and Paxman had well-established production facilities at Colchester. Furthermore, the 12TP was one of very few British engines suitable for driving oil well drilling equipment. It was this combination of circumstances which led to the start of a successful and mutually beneficial business relationship between OWECo and Paxman. OWECo was the largest manufacturer of oilfield equipment outside the USA. It employed up to 1,000 people during World War 2 and around 700 during the 1950s. During the most important period of collaboration between OWECo and Paxman, OWECo's Managing Director was the late Mr L S Dawson. He served 42 years with that company and was its Managing Director for 14 years before retiring in 1961. He became a personal friend of Paxman's Managing Director, Geoffrey Bone, and was presented with a large silver salver which has signatures engraved on the back and the inscription "from your many friends at Colchester". National Supply closed the OWECo works in Stockport in about 1999, having invested about £4 million in it not long before (1). One cannot overstate the importance of the OWECo connection for the development of Paxman's oilfield engine business during the 1940s and 1950s. When Paxman first became involved in supplying engines to the oil industry it was handicapped by the lack of knowledge in the UK about the requirements of oil companies and the demands made on machinery operating in oilfield environments. These hurdles were successfully overcome and the volume of oil industry work increased, becoming a substantial proportion of Paxman's diesel engine business throughout most of the 1950s. The Company established a good name for itself in the industry and could hold its head up high when exhibiting at the World Oil Fair, Tulsa, Oklahoma, in April 1959. Paxman's oilfield engine customers included such well-known names as Shell, BP, Anglo Iranian Oil Company, Iraq Petroleum Company, and Burma Oil. At the end of the 1950s demand for diesel sets for land-based oilfield operations appears to have declined rapidly. However this coincided with the beginning of the North Sea oil boom off the north east coast of Britain. Paxman's previous oil industry experience and its reliable compact high performance diesels put the Company in an excellent position to benefit from the new opportunities opening up on its doorstep. It became a major supplier of engines and generating sets for North Sea drilling rigs and production platforms. Details of some of these and their Paxman equipment are to be found in the Offshore Installations section lower down this page. The basic requirement of the oil companies was for portable sources of power capable of operating reliably in oilfield environments. Oil exploration was being undertaken in some of the most inhospitable and arduous conditions in the world. Heavy demands are placed on any type of plant, not least a high performance diesel, which is worked hard in high ambient temperatures surrounded by dust and sand or in conditions of high humidity. Reliability came very high on the oil companies' list of priorities. The cost of any stoppage on a drilling rig made it essential to keep downtime to a minimum. Then there was the matter of maintenance. The isolated locations of most drilling operations usually meant local workshop and repair facilities were, at least initially, very limited. Provision of good field support, both the supply of spare parts and availability of skilled field service engineers, was to become a major issue for Paxman. Another important factor for oil companies was the portability of power plant. There were the logistics of getting the plant to remote oilfields in the first place. Then, and perhaps more importantly, there was the need to move this plant when rigs were relocated to new drilling sites. The need led to Paxman developing self-contained 'package' diesel sets. Typically an early 1950s set comprised an engine, cooling radiator, control gear, steel sided canopy, air intake filters, starting equipment, water and lubricating oil pumps, hydraulic coupling and cooler for the coupling, all mounted on a fabricated steel skid-type underbase. The base and its skids with large radiused ends were designed to allow a set to be dragged (sledged) to a new location or hauled up onto, or dropped off, the back of a flat bed truck. A rather crude approach to handling plant but in the basic conditions of most oilfields, with no suitable craneage available, these methods were standard practice at the time. The oilfield diesel sets designed and built by Paxman were supplied for a number of different duties. They were made therefore with different sizes of engine and types of transmission, depending on the particular application and customer requirements, but standardised to facilitate swapping sets out for repair and overhaul with minimum disruption to drilling operations. Right: Two early 6RPH oil well drilling sets with compound drive arrangement. Draw-works: the hoisting system incorporating a mechanical winch with a large cable drum. By means of a steel cable attached to the drum, the drill string is suspended and lowered into or drawn out of the bore hole. (The drill string comprises the connected sections of drill pipe and attachments such as the swivel and kelly at the top and the drill bit attached to the lower end.) At regular intervals the drill string has to be withdrawn from the hole so that the drill bit can be replaced, and then lowered back down before drilling can continue. This operation, sometimes referred to as 'a round trip', involves frequent stops and starts of the drive to the draw-works as sections of drill pipe are removed and stacked during 'tripping out', and then re-attached during 'tripping in'. Rotary Table: the rotating circular table set into the derrick floor or drilling platform. The function of the table is to turn the drill string, and thus the drill bit, via the kelly. The latter is a four- or six-sided piece of drill pipe which slides through a matching four- or six-sided hole in the centre of the rotary table, and is attached at its lower end to the rest of the drill string. The drive to the rotary table must be capable of operating at varying speeds and handling heavy starting loads. Mud or Slush Pumps: used to pump drilling mud under high pressure down the inside of the drill pipe. At the bottom end the mud flows through the drill bit to cool, lubricate and clean it. It then flows back up to the surface, between the outside of the drill pipe and the sides of the well hole, carrying with it the rock cuttings and other debris. A reliable prime mover to drive such pumps is essential because a steady flow of mud under high pressure is required to minimise the risks of the hole collapsing and the well possibly being lost. Bill Cooper has explained that on Paxman-engined rigs there were usually three package sets. Two, coupled together, provided power for the draw-works and rotary table, while the third was used to drive the slush pump. Sometimes there was a fourth set coupled to a stand-by slush pump because if the main pump failed, and pumping stopped, the hole could be lost. Bill went on to say that National Supply's Series 250 was the pump mostly used. It required 350 bhp and was well matched to the output of Paxman's 12RPH. The 12RPH engine itself was normally rated 480 bhp but after de-rating for hot climates and allowing for slip in the hydraulic coupling, etc, the available output was set at 400 bhp. John Cove has added that the slush pump would almost always be driven separately as it had to be run at a constant speed to maintain pressure in the hole, whereas driving the draw-works and rotary table entailed variable speeds and periods of idling. John also remarked that although 400 bhp output was typical for driving slush pumps in the Middle East, where holes were not excessively deep, some pumps required 700 bhp to drive them when much deeper holes were being drilled in other parts of the world. Driving slush pumps was not the only oilfield pumping application for which Paxman engines were supplied. Some were used for pumping oil from well-heads to a tanker terminal or refinery. For example five 16YLC engines were supplied to Algeria for pumping oil on the Sahara pipeline. A rather different oil pumping requirement was met at Gulf Oil's large trans-shipment and oil storage terminal built at Whiddy Island, Bantry Bay, in south west Ireland circa 1967. Nine YL engines provided the power for oil and ballast pumping (12 cylinder ?) and electrical power generation (8 cylinder ?). Two 12YH engines were also supplied to Bantry Bay for high pressure pumping. Another duty was pumping water. A specialised example involved a set suppied to ARAMCO (Arabian American Oil Company) for use in Saudi Arabia. Powered by a 12YLX engine, rated 820 bhp at 700 rpm, driving a water injection pump at 3,000 rpm through a speed increasing gearbox, the set was used to inject water into oil bearing strata to increase the flow of oil from wells. Diesel sets were also required for electrical power generation. Paxman generating sets supplied for oilfield service were basically similar to those built for other customers, the main difference being that sets supplied for land-based oilfields were invariably mounted on skid type underbases like the package sets for other oilfield applications. A good number of generating sets for the oil industry were for installation on offshore drilling platforms and in drilling barges such as those on Lake Maracaibo, Venezuela. The prime mover for Paxman's earliest oilfield sets was the Company's 12TP engine, as used in British-built Tank Landing Craft during World War 2. The TP engine was satisfactory up to a point but was not designed for the prolonged periods of running imposed by oilfield and other post-war applications. Modifications were introduced to overcome the weaknesses, resulting in the RPH Series I engine, the post-war commercial version of the TP. In 1951 the RPH Series II was introduced, featuring a heavier crankshaft, an additional main bearing, roller cam followers, and other improvements. By far the largest number of engines supplied by Paxman to the oil industry were 12 cylinder RPHs. 300 of the Series I 12RPH, including 24 turbocharged versions, were in service with the industry as at 31st December 1966. At this date a further 229 of the Series II 12RPH, of various Marks, were also in oilfield service. Apart from 74 of the early 6 in-line Series I RPHs (one bank of a vee 12RPH), relatively small numbers of 4, 6, 8, and 16 cylinder RPHs were supplied to the oil industry. According to a Paxman Sales Engineers' Handbook, from which the above figures are taken, a total of 647 RPHs were in oilfield service by the end of 1966. In due course the 4 valve per cylinder, direct injection YH engine, successor to the RPH, was offered for higher outputs. By the later 1950s the 9¾" bore YL engine was an option for the highest outputs, available in naturally aspirated, turbocharged, or turbocharged and intercooled forms. Venturas and Valentas were supplied later for duties on some British offshore platforms, as described in the Offshore Installations section at the end of this page. The duties for which oilfield sets were used frequently involved heavy starting loads and/or frequent changes in load. For such conditions conventional clutches and gearboxes did not provide a satisfactory solution. Paxman sets, therefore, were generally fitted with either a hydraulic (fluid) coupling or torque converter. Small sets could incorporate a friction clutch and torque convertor in cases where the engine idle speed was insufficiently low to produce negligible output torque during idling. The great majority of Paxman package oilfield sets were fitted with hydraulic couplings. These were generally used for constant speed applications, such as pumps, to enable the load to be brought up to speed. They were also specified where repeated changes were required in the speed of a driven unit. Hydraulic couplings operate as clutches, but without the wear problems encountered with friction clutches. Scoop control types, which allow the amount of slip between input and output shafts to be varied, also offer good control over output shaft speed. Paxman normally fitted the Vulcan Sinclair type (SCR5) in sizes between 23" and 32" depending on engine power output. During the latter half of the 1950s torque converters were given more prominence in Paxman publicity material as an available option. It is said that relatively few Drilpaks were fitted with them. Torque converters were suitable for variable speed applications with widely varying loads. The hydraulic torque converter is an extension of the principle employed in a hydraulic coupling. The fundamental difference is that the latter transmits only the torque it receives whereas the converter multiplies up the input torque to provide higher output torque as the ratio between input and output speeds decreases. Paxman initially fitted torque converters from Brockhouse Engineering but later also offered those made by British Twin Disc Ltd and National Supply Co of America, all leading manufacturers of these transmissions at the time. The maximum efficiency of the above torque converters was approximately 85%. Because of the energy losses in such transmissions, the output rating of sets fitted with them was often given as the shaft horsepower (shp) of the output shaft of the converter as well as, or instead of, the bhp of the engine itself. As Paxman became better acquainted with the special requirements of the oil industry and gained extensive practical experience in the field, the design of its package diesel sets was developed and refined. During the early years Bill Cooper was mainly responsible for the applications engineering of the sets. Subsequently Denis Turner was appointed in overall charge of this function, but Bill continued to work on them. Later in his career Denis became Paxman's rail traction expert and was ultimately appointed the Company's Applications Engineering Manager. Denis recalls that oilfield orders could be for as many as 60 sets at a time and that sets were sometime treated as disposable by the oil companies. Those which were old, well used, and no longer viable might just be abandoned in the field. In passing it is interesting to note that the 'package' concept of a self-contained unit, embodied in the oilfield sets, was also applied by Paxman to the design of some of its industrial boilers. In the mid-1950s the Company started to design and manufacture what it called 'package' boilers. The boiler and all its ancillary equipment were mounted on a single fabricated steel underbase, very similar to that seen on oilfield sets. As part of its promotional activities, Paxman arranged for representatives from the oil industry to visit its works in late 1956. The publicity pack prepared for the event explained that one purpose of the visit was "to examine the now familiar Paxman Oilfield Package Set in its modified form". The modified sets incorporated the naturally aspirated RPH Series II in 4, 6, 8, 12 and 16 cylinder versions with outputs from 100 to 500 shp from the hydraulic coupling. Also included in the range were pressure-charged versions of the YH engine, the 12 and 16 cylinder versions producing 700 shp and 800 shp respectively. The literature announced "The new range of standardised Package Units will be known as Drilpaks". Drilpak power outputs offered in April 1959 ranged from 128 to 800 shp at 1,200 rpm (continuous). By the early 1960s there were fifteen power packs in the standardised Paxman Drilpak range as detailed in the table below. Although 4 and 16 cylinder engines were included in the range offered, Bill Cooper said Drilpaks were only actually built with 6, 8, and 12 cylinder engines. X denotes pressure-charged (turbo-charged); C denotes pressure-charged and intercooled; W denotes oil well drilling application. In the space of only a few years after entry into the oil exploration market, Paxman diesel engines could be found at work in many, if not most, of the world's oilfields. By the late 1950s or early 1960s, the list of countries to which engines had been supplied for this type of work included Assam, Australia (Western Australia and Queensland), Bahamas, Bahrein, Borneo, Britain, Burma, Colombia, Ecuador, Egypt, Iran, Iraq, Italy, Kuwait, Lebanon, Libya, Netherlands, New Zealand, Nigeria, Pakistan (East Pakistan - now Bangladesh), Papua, Peru, Qatar, Sarawak, Saudi Arabia, Sumatra, Syria, Tanganyika, Trinidad, Tunisia, Venezuela, and Zanzibar. One of the earliest sources of oil industry business for Paxman was a joint Shell and BPM (Bataafsche Petroleum Maatschappij - Batavian Petroleum Company) project at Schoonebeek, near Emmen in the Netherlands. Oil was discovered here, right on the German border, in 1945. Because of the politics of the time, just after the war, the drilling rigs were sited on the Dutch side of the border but drilling was done at an angle to tap wells under German soil on the other side of the border. Before long Paxman-engined drilling rigs were being supplied to many other parts of the world. By 1960 the Company had sold 683 engines for oilfield duties. The biggest customers, by a good margin, were Iraq (Iraq Petroleum Co), Iran (BP and Anglo Iranian Petroleum Co), and Venezuela (Shell Petroleum Co). In the Middle East, Qatar and Kuwait were also important customers. In South America, in addition to Venezuela, significant numbers of engines were supplied to Trinidad, Ecuador, Colombia, and Peru. Elsewhere, substantial numbers of sets were supplied for service in Britain, Borneo, the Netherlands, Nigeria, and Burma. With the growing demand for oil in the post-war years, the oil companies were under great pressure to increase their output. They in turn put pressure on Paxman to supply the quantities of engines required for drilling rigs and to support these engines in the field. To meet the latter demand the Company established spares depots in various parts of the world and worked to ensure service engineers were available to respond at short notice to requests for repairs and maintenance. Sometimes the urgency of the situation called for extraordinary efforts including, on one occasion, the chartering of two 'York' aircraft at very short notice to fly fluid couplings to Iran. That particular episode may have been influenced by international politics, a matter never far removed from oil. Britain had major oil interests in Iran which was Paxman's second largest customer for oilfield sets. Muhammad Mossadeq, the radical Prime Minister of Iran, nationalised the country's oilfields in 1951 and his stance towards Britain created a difficult political climate until he was deposed in 1953. Geoffrey Bone, who became Paxman's Managing Director in 1954, considered that it was the demands from the oil industry which created the biggest worries for Paxman's senior management from the late 1940s up to about 1952/53. At that stage the Admiralty's need for large numbers of the new YHA engine became a more pressing concern. References to some of the oilfield projects for which Paxman supplied engines are to be found in a few surviving publicity brochures, old issues of Company house magazines, and the Paxman Sales Engineers' Handbook (published c. 1967/68). The information in them reflects the importance of this business to Paxman at the time, its global nature, and sheds light on some of the prestigious major projects in which the Company played a part. Three apparently typical installations referred to were in Western Australia, Venezuela, and Italy respectively. Each featured the Ideal 100 rig, manufactured by the OWECo and powered by 12RPH Series II engines, each of the latter being rated 400 shp at 1,200 rpm. The Western Australia Petroleum Pty Ltd installation had three engines and that of Compania Shell de Venezuela had two. Three 12RPHs were used to drive the rig owned by AGIP (Azienda Generale Italiana Petroli Mineraria). Five 12RPH Series II engines powered another rig at Mafia Island, Tanganyika. 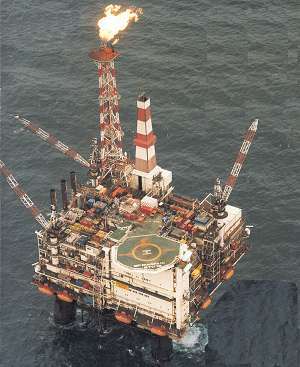 Right: AGIP rig - the three RPH engines and their exhaust stacks can be seen in the centre of the photograph. The AGIP rig was 'spudded in' on 31st March 1954 at a site about three miles from Cortemaggiore, in Emilia, Northern Italy. Here the three 12RPH engines, with a combined power output of 1,200 shp, were used to drive two C.350 slush pumps as well as the rig itself (source: Colchester Newsletter No 10 , of December 1955). 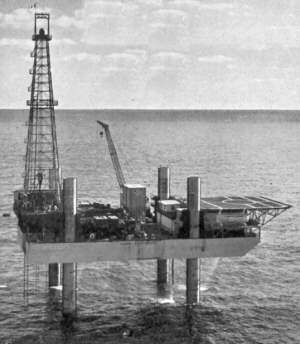 The above four rigs were all in operation by 1955, as was an Ideal 100 drilling rig powered by four 12RPHs, engaged in offshore drilling seven miles south west of Trinidad. The first oil well drilling in England was undertaken by BP and D'Arcy Explorations Co at Eakring in Nottinghamshire with rigs powered by Paxman package sets. 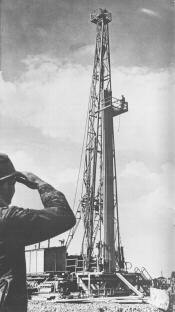 The Spring 1956 issue of Paxman World, the Company's house magazine, reported that considerable oil well drilling was happening in the Nottingham area. Boreholes had been drilled by rigs using 6 and 12 cylinder RPH Series I engines. It was expected that by early 1956 two new rigs would be in operation, using 6 and 12 cylinder RPH Series II engines, making a total of 13 RPHs providing power for drilling rigs in Britain. The photograph shown here is of BP Exploration Co's rig at Plungar, in the Vale of Belvoir near Nottingham. It was used on at least one or two pieces of Paxman's publicity literature. As previously mentioned, one of the biggest oil industry customers was Venezuela. Here large numbers of Paxman diesel sets provided the power for drilling on Lake Maracaibo. By 1955 the Shell Petroleum Company was operating its GP (Gabarrón Perforación) 3, GP4 and GP5 drilling barges on the lake. Six 12RPH Series II engines, rated at 500 bhp each, were installed on each barge. Four were incorporated in package sets to power large mud pumps and the remaining two were used for driving generator sets. The Summer 1956 issue of Paxman World reported that two more barges, each with six Paxman engines, would be operating on Lake Maracaibo in a short while. The same issue also contained references to four 12RPHX package sets in the jungle at Sogamoso, Colombia, powering "a rig of the largest type in construction today", 6RPH sets operating in Ecuador, and 6 and 12 cylinder RPHs in Northern Peru. At a later date Paxman supplied six 8 cylinder YLC engines to Compania Shell de Venezuela for two new drilling barges, GP9 and GP10, built to operate on Lake Maracaibo. 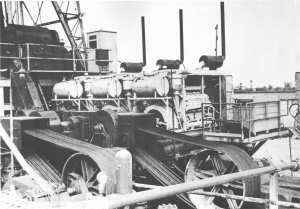 The engines, each rated 900 bhp at 850 rpm, were coupled to generators as these barges featured a diesel-electric arrangement for powering their electric drilling rigs. Between November 4th and 14th, 1955, 192 tons of oilfield equipment, including four 400 bhp 12RPH package sets, were airlifted in nine flights for Iraq Petroleum Co from Umm Said (Qatar), a well-established stores base and oil port, to Fahud (Oman), a low hill lying in the heart of the desert, a distance of 365 miles. In about 1937 Oman granted a 75 year concession to Iraq Petroleum Company which started to drill its first well in Fahud in early 1956. The first wells drilled in Oman were dry and oil was not struck in the country until 1962. Throughout the immediate post-war decade the normal practice of British oil companies was to handle the practical task of oil well drilling in-house. They purchased their own rigs and engines, hired their own drilling crews, and managed day to day operations themselves. In contrast, by the mid-1950s in the USA, the firmly established practice of American oil companies was to put this work out to specialist drilling contractors. Adoption of this American practice by British oil companies may have been accelerated by events in Iran during the early 1950s. Iran's radical Prime Minister, Muhammad Mossadeq, nationalised the country's oil industry in 1951 and the Anglo Iranian Oil Company was renamed the National Iranian Oil Company. Because of strong anti-British sentiment the Iranians wanted to make a clean break from the Anglo Iranian Oil Company and its London headquarters which, prior to nationalisation, had controlled their oil industry. Iran called in American drilling contractors to replace the British operators. John Cove recalls that the American contractors arrived in Iran with fixed ideas of how to drill for oil and had little use for any equipment with which they were unfamiliar. They started off by using the existing equipment but did not have an easy ride because they were unused to the differences between drilling conditions in the Middle East and those found in the USA. The Americans were unprepared for the very high pressures encountered in wells at relatively shallow depths and suffered some blowouts as a result. John Cove well remembers his visit to an Iranian well which had blown out and caught fire. It had burned for some time before Red Adair was called in and finally succeeded in putting the fire out and capping the well. The site was a shambles. One 12RPH engine, still recognisable as such, had been fused into a solid lump with all the parts melted together. The desert was littered with long lengths of 4" drillpipe twisted together like spaghetti. Apparently the pipe had simply been spewed out of the well by the high pressure. During 1956/57 two contracting companies became active in Europe, Nederland Boormaatschappij in Holland and Kier Cawder Arrow in the UK, rapidly followed by Santa Fe and other established American companies. Initially these contractors worked closely with the oil companies, using the latter's equipment and engineering services and operating their existing machinery. While such arrangements continued, Paxman was able to sell engines to contractors. By around 1957/58 the use of drilling contractors had become standard practice for British as well as American oil companies. John Cove has remarked that although American drilling contractors used those Paxman package sets already in place on drilling operations they took over, they had no use for the 'package' (Drilpak) concept and would not order any replacements. Paxman's response was to offer simpler, cheaper sets just called 'oilfield diesel engines'. There is evidence these were advertised in a Paxman brochure as early as July 1957 (Pub. 1551). Detailed specifications are given in Paxman's price list for its 'standard oilfield diesel engines', effective 1st May 1959 (Pub. 1571). Unlike the package sets, these engines were not mounted on a skid-type underbase but supplied only with four cast feet bolted to the crankcase, suitable for ledge mounting. A cooling radiator and instrument panel were included with the engine. However, a suitable drive arrangement for a fluid coupling or torque converter, as well as the coupling or converter itself, was charged as an extra. To give some indication of prices, the May 1959 list price of the standard 6RPH 'oilfield engine' was £4,295 and of the 12 cylinder version £9,340 (1250 rpm) or £9,392 (1,500 rpm). Despite Paxman's efforts to adapt to the changing market, it was unable to overcome the contractors' strong preference for American engines and had little success in selling even these basic oilfield engines. During the late 1950s significant changes were also taking place in the scope of contractors' responsibilities and their relationships with oilfield equipment manufacturers. Contractors became responsible not only for providing manpower and managing the drilling, but also for supplying all the necessary equipment, including rigs and engines. In nearly every case the contractor was supported and financed by one of the major American oilfield equipment manufacturers, such as National Supply Co and Oilwell Supply Co. These organisations providing contractors with everything they required, 'down to the driller's hard hat'. They strongly favoured American engines, particularly those of GM, and had agreements with engine builders who offered such inducements as exchange schemes, replacing worn engines with new. In addition the supply houses offered arrangements for field servicing. The combined effect of all these changes was to give the large American supply houses a very strong hand in controlling the oilfield equipment market. Paxman's lack of success in persuading American contractors to buy Drilpaks or its oilfield engines may also have been due in part to a fundamental difference between British and American philosophies regarding repair versus replacement. Paxman engines were designed for long service life and ease of maintenance, with the higher initial cost being outweighed by their superior quality, reliability and lower through life costs. Paxman engines, for example, regularly achieved 20,000 operating hours between overhauls compared with 5,000 hours for the GM engines popular with contractors. However the American culture and practice was one of replacement rather than repair. That combined with the lower initial cost of American engines, the contractors' familiarity with them, a strong preference for American engines and favourable agreements with their builders, resulted in Paxman being effectively frozen out of the oilfield engine market. It would appear the difficulties faced by Paxman at this time were compounded by events in the oil market itself. Bill Cooper remembers that in 1958 there was a surplus of crude on the world market. Faced by a lack of demand the understandable reaction of oil companies was to cut back on drilling activities which had a knock-on effect on requirements for drilling equipment and engines to drive it. Such was the background to the sharp and ultimately terminal decline in Paxman's sales of engines for land-based oilfield installations which occurred at the end of the 1950s. 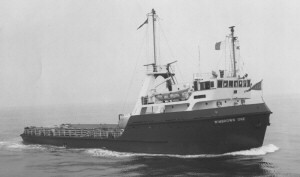 Although a few engines were supplied for this market during the early 1960s, the more significant oil industry market for Paxman was becoming the offshore one. The high power to weight ratio and reliability of Paxman engines has made them particularly suitable for offshore oil and gas platforms where space is at a premium and dependable power supplies are critical. Paxman supplied engines for offshore drilling rigs as far back as the early 1950s. The involvement with offshore installations continued to grow and provided a valuable source of business, particularly during the North Sea oil boom from the mid-1960s to the early 1980s. Supplying engines and generating sets for such high profile projects, where reliable performance under demanding conditions is essential, also provided a valuable reference for Paxman when selling to other industrial sectors. Seven Paxman engines were supplied for BP's mobile drilling platform 'Adma Enterprise' (ADMA = Abu Dhabi Marine Auxiliaries). Built in the Netherlands around 1956, the platform was the first of its type to be constructed in Europe. It was towed via the Mediterranean and Suez Canal to Das Island, off Abu Dhabi in the Persian Gulf. Here final fitting out was undertaken in 1957 before 'Adma Enterprise' was moved into position and commenced drilling the Umm Shaif field in January 1958. The platform itself, designed to operate in a maximum water depth of 80 feet, was 200 feet long, 100 feet wide, and 15 feet deep. Power for the rig's drilling and pumping operations came from four 12RPHs, each rated at 480 (or 430?) bhp at 1,200 rpm. The remaining three 12RPHs were more conservatively rated, 335 bhp at 1,000 rpm, and were each coupled to a 220kW, 440 volt, three phase alternator to meet the platform's electrical supply needs. 'Adma Enterprise' had a further Paxman connection in that one of the vessels used to transport men and materials to it was a converted tank landing craft with four 12 RPHM propulsion engines. Right: 'Adma Enterprise' off Abu Dhabi. Another major offshore project relying on Paxman prime movers was a deep water tanker terminal. The July 1960 issue of Ruston Review & Paxman News reported "24 miles out in the Persian Gulf a new £16,000,000 deep water tanker terminal is now nearing completion". The complete terminal 'island' was to consist of five platforms, mounted in line and linked by a walkway. Built for the Basrah Petroleum Co (associates of Iraq Petroleum Co), it was needed to overcome the severely restricted oil loading facilities at Fao, Iraq's southern port and main outlet for the large Rumaila and Zubair oilfields. All the electrical power requirements for the platform were supplied by six 1,000 rpm 12RPHZ engines driving 255 kW alternator sets. The July 1960 Ruston Review & Paxman News also referred to Shell International Petroleum Co's new offshore underwater drilling platform, 'Triton'. Two Paxman 12RPHs provided the power for this platform's drilling operations. BP's 8,500 ton semi-submersible drilling platform, 'Sea Quest', was launched at the yard of Harland & Wolff, Belfast, in January 1966. At the time it was one of the largest and most expensive offshore drilling rigs to be built anywhere in the world, involving a total investment of around £3,500,000. Three 12 cylinder Paxman YLCW engines, each rated at 1,640 bhp at 900 rpm, were supplied to drive the main generator sets. These had AEI tandem 570kW DC generators supplying power for drilling. A further YLCW, producing 1,060 bhp at 900 rpm, was coupled to an AEI 750kW alternator for the main AC supply. 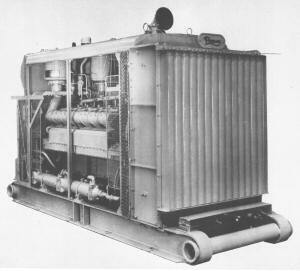 An emergency generator set comprised a 4RPH engine, with a continuous rating of 192 bhp at 1,200 rpm, coupled to a Macfarlane 125kW alternator. In spring 1974, to speed up drilling operations, Paxman supplied BP with two additional 660 bhp 12YH engines for the rig. It was Sea Quest which discovered the large Forties field, 110 miles north east of Aberdeen, in October 1970. Right: BP's drilling platform 'Sea Quest'. To access the reserves discovered in the Forties field, four giant production platforms were constructed. Two were built by Highlands Fabricators at Nigg Bay, Cromarty Firth, and two by Laing Offshore on Teesside. The platforms were designated FA, FB, FC, and FD, and the first - FA, also known as Graythorp 1 - was floated out in June 1974. Each had two 600kW generating sets, driven by Paxman 12YHX engines running at 1,500 rpm. These sets were used for testing, commissioning, and drilling operations until the gas turbines were commissioned, after which they were used for supplementary and emergency power. 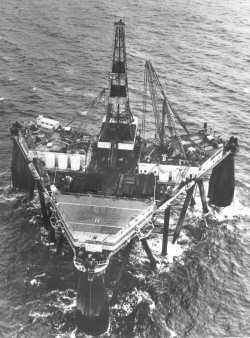 The first British oil from the Forties field came ashore on 3rd November 1975. Four supply ships built to service North Sea rigs and platforms also relied on Paxman engines. Wimbrown I, II, and III each had two Paxman 12YHXM engines, each rated 900 bhp at 1,500 rpm, for main propulsion and two 4RPHXZ auxiliary 120kW generator sets. Lady Edwina was built by J Lewis & Sons Ltd of Aberdeen and fitted with two Paxman 6RPHCM propulsion engines, each rated 332 bhp at 1,200 rpm. built by Cleland of Wallsend. One of the potential hazards of oil exploration and production is the release of large volumes of highly flammable natural gas under great pressure. The risks to an offshore platform hardly need elaboration and extensive fire-fighting measures are essential. Paxman supplied engines for driving fire pumps on a number of North Sea platforms. In the event of an emergency the 'black start' packages had to be capable of starting without reliance on any other power sources on the platform and of quickly coming up to their normal operating speed. The fire pumps were not intended to extinguish any fire but to keep the structure sufficiently cool to prevent it buckling or collapsing, and so avoid the additional problems and environmental damage which would otherwise ensue. Details of seventeen Paxman engines supplied c.1978/79 for Shell production platforms in the North Sea appear in the table below. The 1980s saw further orders for Paxman generator sets for offshore platforms. Two stand-by generating sets, each powered by a 16 cylinder Valenta, were built for BP's North Sea production platform in the Magnus Oil Field. These sets were despatched in late 1981, at which time the platform was expected to commence production in 1983. Right: BP's Magnus production platform. Three generator sets were supplied for the Morecambe Bay gas platforms, off the north west coast of England, operated originally by Hydrocarbons GB Limited, a subsidiary of British Gas. The largest, providing 2MW of electrical power for the Central Processing Platform (CPP1), was powered by a 16 cylinder Valenta. Also on this platform an 8 cylinder Valenta-engined set provided power for the electrically driven fire pumps. The 1.5MW generator on the adjoining accommodation platform was powered by a 12 cylinder Valenta. The three sets were despatched in 1983-84 and initially provided all the electrical power for the platforms until the gas turbine generator sets were commissioned, after which they were retained as emergency stand-by sets. 1. I am grateful to Mr David Dawson, Mr L S Dawson's younger son, for this information about OWECo and his father. The silver salver referred to in the text is still in the possession of the Dawson family. Acknowledgements: I am indebted to the late Denis Turner, John Cove and the late Bill Cooper for their help during the preparation of this page. Denis spent most of his career in Paxman's Applications Engineering Department, including a period when he was given overall responsibility for oilfield engine applications. John Cove worked for Paxman from 1948 to 1966, progressing his career through appointments in a number of different departments to become Marketing Director. (During a later period he held senior appointments with Ruston Paxman Diesels.) John has been particularly generous with his assistance, drawing on his wide personal knowledge and experience gained at the time when Paxman's oilfield engine business was at its most active. Bill Cooper spent several years designing oilfield package diesel sets and very willingly made available to me his detailed knowledge of the subject. I am also deeply grateful for the kindness of the late Geoffrey Bone, Paxman's Managing Director from 1954 to 1964, who shared with me his reminiscences of the oil industry business when we discussed Paxman's post-war history during a series of meetings in the summer of 2002.